– Do I need a main deity to practice Kemeticism? If so, how do I get a main deity? – Am I able to say no to a deity that shows up at my shrine? – Am I obligated to learn everything I can about my main deity? 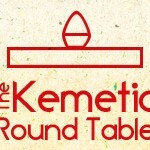 What do you actually need to do to be Kemetic? I would say: you need to do your best to live in ma’at, to acknowledge and honor the Gods and your ancestors, and to support your community, in whatever form that community takes for you. (If you’re Kemetic Orthodox, add in “acknowledge and respect the Nisut’s role as spiritual teacher and leader.”) Does any of that necessarily involve a close interaction with a singular deity? No. Do you personally need to have a primary deity? I think that’s the question people coming to the religion ought to be asking themselves. Does that kind of relationship feed something in you, a hunger that nothing else can satisfy? (And is it a real hunger, or just a “junk-food hunger”?) Are you looking for very specific help or support with a particular task or career, or just to get on the better side of life? Or are you hearing a direct call from Someone, whether you know who it is or not? In those cases, or others like them, the answer is more like: Maybe. You can look for help in more than one aspect of your life at once. You can have more than one God ask for (or demand) your service. You can, but you might or might not. There are so many ways to have relationships. There are so many ways to love. And you can always say no, but He or She (or They) might very well keep trying. And you might change your mind given further persuasion, but it’s always your mind to change. As for learning, if you love your God deeply, completely, truly, you’ll probably want to know everything about Him or Her. Love inspires the desire for knowledge, knowledge brings power, and I believe that the Gods want us to be powerful, each in our own way. We best serve with knowledge; we best become ourselves with knowledge; and our service is our becoming, our becoming our service. Even if you see your relationship with a God more as a business transaction, wouldn’t you research your business partner? Look for strengths that can help you, or quirks (or worse than quirks) that could trip you up? Knowledge is never wasted. For me, Bast is my center, but in my perception of Her, She also lies at the center of a web comprising relationships with other Gods, entities, and elements. So She is not just the primary focus of my love and devotion, She orients my conception of the Divine, my cosmology; She is the spindle that gathers all the threads of my interest, study, poetry, mythology, the hands that cup the world. Other non- or less-related Gods pass through, and I have relationships of varying strength with them as well, but I find that, while those other Gods are not diminished, the Gods that are connected with Her are magnified by that connection. Of course, I’m all about hunting down obscure bits and pieces and stringing them together into sentences and chains of meaning, and I do my best work when I’m monofocused. So your experience almost certainly will vary.